Can you believe it’s already the middle of November?! Because of this recent realization, I’ve been working super hard behind the scenes this week to prep for my time off around Thanksgiving, Christmas, and New Years. As a solo-preneur, I often struggle with the fact that, if I don’t do it, it’s just not going to get done. So, I have to think well in advance to make sure I prep all of my social media posts and get all of my blog content photographed, written, and scheduled before I head out of the office. I’m definitely not complaining—sorry if it seems like I am. This is my dream job and one I try not to take for granted, but, like any job, some weeks are harder than others to get though. All this to say…today’s room tour is going to be more of a photographic post then a descriptive one so I can get away from this computer screen. 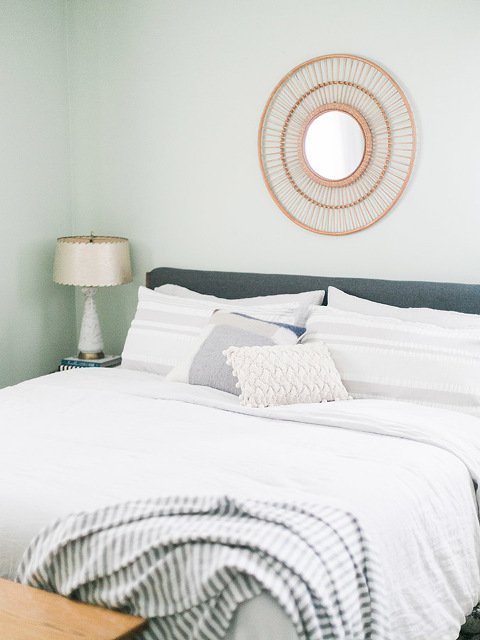 Scroll on to see the latest state of our master bedroom, and hear about a few of the tiny tweaks I have up my sleeve as the design continues to evolve. 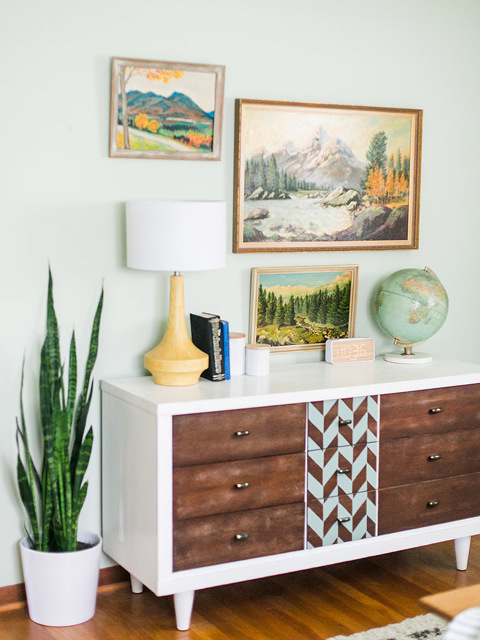 If you’ve been following along since we moved into our 1960s ranch two years ago, then you know this room is the only one in the house that wasn’t repainted white. Instead, we left the pretty greenish blue color alone, and decided to go neutral everywhere else to let that soothing tone take all of the attention. Aside from a new striped bedding set and switching out my bookshelf for a new dresser, not much has changed since these photos were shot back in June. It’s still the minty fresh, soothing oasis it has always been—and, frankly, might always be. I don’t really have all that much on my list of things to do in this space (aside from finding a match to the paint color so I can patch over the many holes I’ve put in the wall). 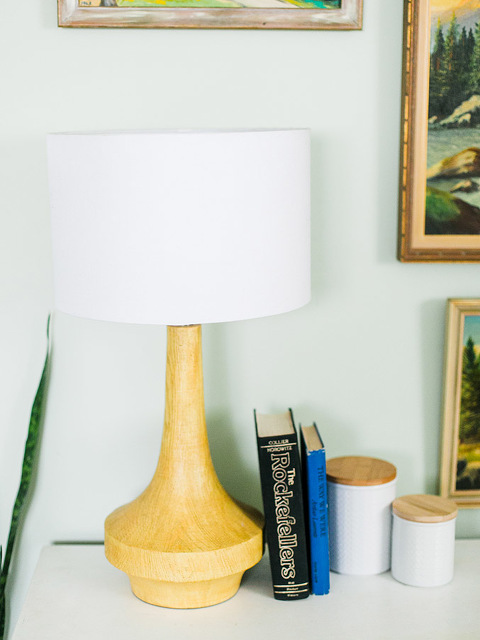 I would love to replace the broken blinds with cordless cellular shades, like the ones I’ve slowly been installing throughout our house, and I wouldn’t mind updating a few pieces of furniture so that it didn’t feel quite so mismatched. 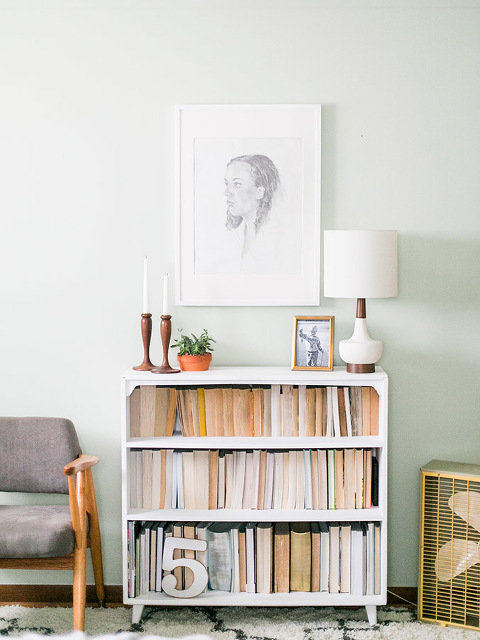 Honestly, thought, it’s one of my favorite rooms in the house as is, and was a big part of my inspiration for completely redirecting my brand and business toward a calmer color palette and style in the beginning of the year. When you want nothing more at the end of the day than to curl up in a specific room with a good book and a cup of hot cocoa, you know you’ve done something right. That’s our master bedroom to me. This space came together so organically thanks to the wall color we inherited from the previous owners, that I really don’t feel like I can take any credit for it. It just feels right, and I couldn’t be happier or more grateful that I get to call this room—and this home—ours. So, that’s the full tour of our master bedroom! I know I sort of glossed over the practical details, so if you have questions about the layout or suggestions for things we could try next, I’m all ears! Before I go, I have to ask: did you enter our giveaway yet? DGD’s Marketing Manager, Nikki (of Wise Apple Vintage) and I are teaming up to give away a prize pack of DIY and vintage goodies. Click through to Instagram here to enter, and see the DIY tutorial with more details here. Good luck!